Potential members must demonstrate a commitment to academics as well as service. We require a 2.75 GPA and 10 hours of community service for new members to initiate. Our members are students before they become Phi Psis, and we make success in school a priority. 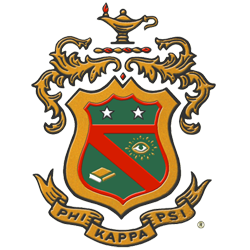 In addition to recognizing our top scholars with awards at national conventions, our Foundation gives thousands of dollars to deserving Phi Psis each year in the form of national and chapter scholarships, grants, fellowships and assistantships, while promoting learning, high ethical standards and constructive citizenship. President Woodrow Wilson, Zach Braff, and Tony Horton are all initiated brothers of the Phi Kappa Psi Fraternity. We are partnered nationally with the Boys and Girls Club of America, who we raise thousands of dollars for and contribute as many man hours towards each year. Our current philanthropy is Fraternal Fued which raised the 2nd most of all fraternities on campus. We also actively participate in as many local philanthropies as possible, helping sororities raise thousands of dollars as well as awareness for organizations such as Service for Sight, CARDV, St. Jude Hospital, and many many more.